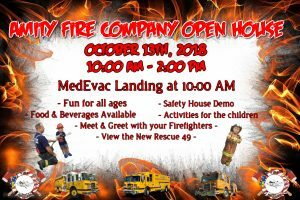 Come on out to our annual open house event on October 13th, 2018 from 10:00 AM – 2:00 PM! We will be having a MedEvac landing at approximately 10:00AM (weather depending.) Food and drinks will be provided by our Auxiliary Members. A special thank you to Mission BBQ of Wyomissing for donating pulled pork sandwiches for our community members to enjoy! Come view our apparatus, go inside the smoke house for a demo, and meet some of your local hero’s! We hope to see you all there.